Welcome to Manor Farm Engineering, the home of cutting edge technology and old fashioned service. After 35+ years of experience gained in solving daily technical problems in the Marine Engineering world Kevin Slater has now come ashore to offer this expertise under the umbrella of Manor Farm Engineering. Kevin, a Chartered Engineer, has long practical experience which is supplemented by a Masters Degree in Engineering (MEng) plus numerous specialist courses covering topics as diverse as 3D CAD and Pollution Prevention. Apart from the real world experience gained at sea, Kevin added valuable insight into Product Development and Design during his MEng studies. He has been involved in several projects, bringing them from conception to prototype - click the 'Recent Works' buttons to learn more. 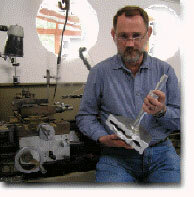 In the picture above, Kevin can be seen holding an early prototype of a locking mechanism developed to hold floating pods together. It was originally conceived for use in the movie industry but many ancillary uses have since been suggested.